sea level rise-FLOATING CITIES: SCIENCE FICTION OR A SOLUTION TO RISING SEA LEVELS? 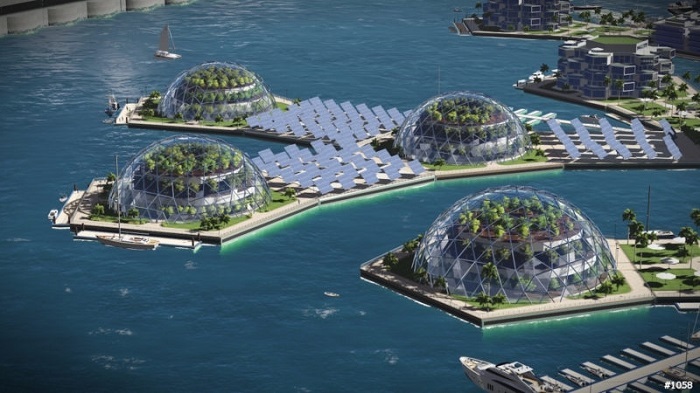 FLOATING CITIES: SCIENCE FICTION OR A SOLUTION TO RISING SEA LEVELS? Fast-paced climate change is upon us. Rising sea levels are no longer a secondary concern but one that is at the forefront of our minds and our media, and it's time to get creative. According to the Intergovernmental Panel on Climate Change (IPCC), "mean sea level is projected to rise by tens of centimetres, and possibly more than a metre, by the year 2100, due primarily to thermal expansion of the oceans and increased melting of land ice." Canada's coastal cities are particularly vulnerable, the IPCC found that Halifax had seen a sea level rise of 3.3mm per year throughout the 20th Century, while rising on Vancouver Island is estimated to be at 1.6mm per year and Tuktoyaktuk in the north at 2.4mm per year. The Ecology Action Centre (EAC) in Halifax works alongside Nova Scotia Environment and the Department of Fisheries and Oceans Canada to raise awareness about rising sea levels in coastal cities. Coastal Community Outreach Coordinator, Brittany McIssac says last year they "launched the website www.sealevelrise.ca, where [they] translated scientific climate change research into useable information for coastal residents, fishermen, and municipalities." The EAC also held two workshops to inform coastal community residents of the impacts. She says "people have a lot of questions about what sea level rise means for them, their homes, neighbours and communities." EAC will be partnering with organizations in other Atlantic provinces as well as British Columbia next year to expand the workshops. For centuries people have mostly managed rising sea levels by building dikes, drainage basins and moving inhabitants to areas of higher elevation. But some newer ideas are a little more out there. In the wake of the 2010 earthquake in Haiti, an area also known for extreme flooding, a Boston-based architect came up with a design for what he called Harvest City. His concept was a floating agricultural city off the shores of the island that would provide living quarters for 30 000 people, however the idea never materialized. 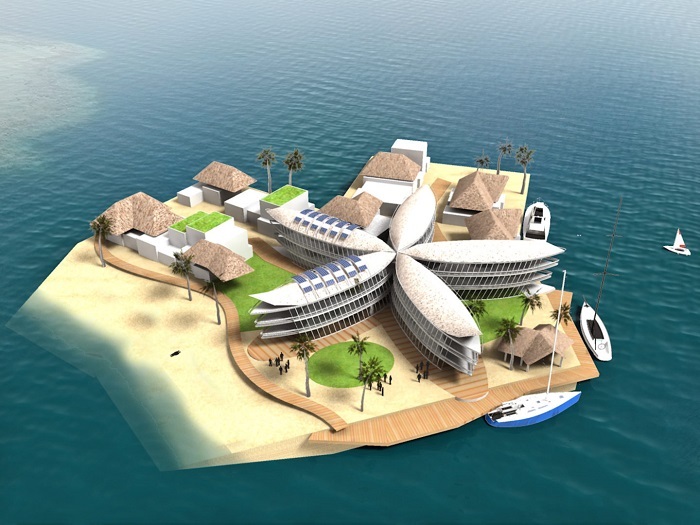 More recently, The Seasteading Institute began actualizing their own vision of floating island cities. The San Francisco based non-profit was founded in 2008 by Patri Friedman, grandson of famous economist Milton Friedman. This year, Friedman and current president of The Seasteading Institute Joe Quirk, published a book on seasteading in which they argue that floating cities are the next step to dealing with rising sea levels. Their efforts were aided by over a million dollars in donations from co-founder of Paypal Peter Thiel who in a 2009 essay wrote "between cyberspace and outer space lies the possibility of settling the oceans." It should be noted that he is no longer part of the project and no longer believes it to be a viable option. The company is hoping to raise more money through initial coin offerings (ICO), a form of virtual currency not dissimilar to Bitcoin. In January 2017, The Seasteading Institute announced their partnership with the French Polynesian Government to develop floating cities off the coast of Tahiti with the signing of a Memorandum of Understanding. The development of this pilot project will be carried out by their new for-profit company Bluefrontiers; they hope to start construction as early as next year. French Polynesia is an overseas collective of France, and has a population of 287 000 spread out over 67 islands. It's tropical climate may seem suitable for such an idea but in the South Pacific Ocean tropical cyclones are not uncommon between the months of November and April. In 2010, Cyclone Oli tore through the region with 195km winds, causing thousands of people to evacuate and knocking out many power and telephone lines. At Simon Fraser University, Dr. John Clague is an earth sciences professor; he also chairs the CRC in Natural Hazard Research. He explains that "in subtropics you have hurricanes, I can't imagine it's not going to be at risk from those, of being destroyed. If you look at oil platforms, they're anchored, well protected, and even the Ocean Ranger was destroyed some 20 years ago. How are you going to have a city to protect to the extent that you can protect bomb-proof structures? Maybe in reducing one risk we are increasing another; to actually create an environment where millions of people are protected and living on a floating city seems impossible." People have been working and living on offshore oil platforms for decades now. In early 2014, Shell began production on Olympus, a 40 story high structure tethered to the seafloor in the Gulf of Mexico. It employs almost 200 people; the living quarters are said to resemble a windowless office building. The structure is built to stand up to the frequent hurricanes in the Gulf. It is not unlikely that a floating city would require some of the same proven engineering techniques to protect people, and the structures from storms. In Canada, that would also require a structure capable of withstanding cold temperatures. The Berkut Platform on the Russian Pacific Coast is the largest in the world and cost roughly $12 billion to build. It's building costs were inflated due to the requirements that it be able to operate in near -50C degree temperatures, and be able to manage 60 foot waves and 6 feet of ice. While coastal cities like Vancouver and Halifax do not experience temperatures like these, these parameters might not be uncalled for in the case of another coastal city to the north, Tuktoyaktuk in the Northwest Territories. For now, in addition to raising the required funds, Bluefrontiers has a lot of work to do before they can begin building. Their agreement with French Polynesia requires an economic impact analysis be performed as well as the development of an environmental assessment framework. truction date, though they have begun recruiting new citizens through what they have dubbed Insider's Access Week. Interested parties were asked to submit their names, and those chosen were invited to attend the week long event from October 22-28 of this year. For $10 000 and the price of air travel to Tahiti, participants explored the region, attended discussions, visited research centres and enjoyed morning yoga sessions lead by The Seasteading Institute's executive director Randolph Hencken. Dr. Boris Worm is a Marine Research Ecologist and Associate Professor at Dalhousie University where he leads his own lab. Worm says he believes that floating cities "are an interesting idea, but likely only available to very wealthy people. Most people that will be negatively affected in the Pacific Islands or in low lying countries like Bangladesh will not have the means to move into a floating city." Simon Frasers' Dr. Clague says in his opinion he doesn't think it will work as a self contained sustainable environment. He explains, "in Tahiti, they're no longer totally Indigenous. They require things you would not be able to provide." Dr. Clague related the case of an Indigenous people living on Lake Titicaca on a system of floating islands that functions for them. The Uros live on islands made of totora reeds that float around the lake. Their artificial floating islands were not conceived from a need to cope with rising sea levels but rather to flee from the Incas. Generations later they continue to inhabit the islands, adding more reeds to the surface ever so often as the bottom reeds disintegrate. They also use the reeds to build their houses, boats and furniture. They are able to partly sustain themselves from fishing and selling crafts to tourists but they remain tethered to shore for other supplies. Recently they have added some solar panels and a radio that they share on the main island. While the Uros have lived on floating islands for centuries they are not fully self-sustaining; one finds it difficult to imagine how our consumer culture would manage. Of course, by comparison the islands imagined by Bluefrontiers would have electricity and be built from concrete making it more difficult still to imagine. Dr. Clague specified that "humans are capable of off the wall solutions to problems, that's why we shouldn't rule anything out. But it kind of takes you away from the real problem that [Bluefrontiers is] trying to address, it's really indicative of societal behaviour." He went on to say that while he believes it could work on a small scale, "to transform a mega city in to a floating city is not a solution in my opinion. For Fraser River Delta it probably wouldn't work - from an engineering perspective it's not feasible." Dr. Boris Worm also related the need for societal change saying �the difference between moderate and catastrophic sea level rise is in large part determined by the growth (or not) of greenhouse gas emissions. At this point all indications are such that the worst case scenarios can still be avoided by following the Paris climate accord. Still, millions of people will be affected, even if only moderate flooding occurs, particularly in areas also affected by increasing storm frequency." It's difficult to imagine the concept of floating cities off of Canada's coasts where storms and cold weather would be a constant challenge. In the winter the water is less navigable, and supplies might have to be brought in by air which is very expensive and has a large carbon footprint. Additionally, large numbers of people live right on the coastline, which would mean the islands would have to serve high populations. I spoke to Energy and Environment Program Manager for Halifax Regional Municipality (HRM), Shannon Medina to see if the concept had been explored by the Canadian coastal city. Medina said that "to my knowledge HRM has never been approached about a floating city model. I really don't think we'll be looking into it for the short term, but it will be interesting to see overtime..." She explained that while they do a lot of work on sea level and flooding this was not something they were currently looking into. Medina said that HRM has acquired $1.4 million from the National Disaster Mitigation Program to redo their LIDAR, a remote sensing technology used for coastal mapping. They are currently working with a 3.8 M vertical setback requirement and require that climate change predictions be taken into account for new development in areas like King's Whorf. She said that "council has adopted a scenario for decision making that would account for the inevitability of sea level rise." She also explained that after Hurricane Juan destroyed part of Point Pleasant Park, they decided to leave an area referred to as the tidal lawn as green space rather than build on it again to allow for flooding in that area during a storm or heavy rain. Medina said about residents living in high risk zones, that they have "raised the idea of retreat in the future, [within] conferences between the province and the city." Communications Coordinator for Sustainability for the City of Vancouver, Alexandra Turnbull said that "for some communities floating cities might be a very good answer to sea level rise. Vancouver can still accommodate our planned growth and protect our shorelines without resorting to floating neighbourhoods for now, but in the future it may be an option for Vancouver to consider." She explained that the city is being proactive in dealing with sea level rise with the creation of the Climate Change Adaptation Strategy and the Coastal Flood Risk Assessment programs. Turnbull added that "the City of Vancouver has integrated this standard of 1 metre of sea level rise into our Building Bylaw and other land use and infrastructure policy." The city has also initiated their Renewable City Strategy, she describes as "a 35 year plan to transition to 100% renewable energy and reduce carbon pollution by at least 80% before 2050." While Canadian cities are not yet embracing the idea of developing floating cities of their own, that is not to say the idea can't work on a small scale. British artist Richard Sowa has built his own floating island off the coast of Mexico from collecting plastic pop bottles and wooden pallets. The island is completely self-sustainable; growing it's own food and housing it's own farm animals. The island was made from 100 000 recycled plastic bottles and spans 25 metres. Now equipped with solar panels, an Internet connection and a wave powered washing machine, he lives there with his wife and says they have everything they need. 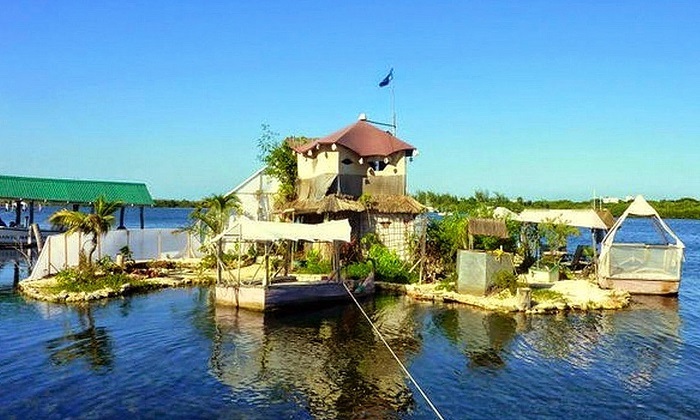 Even still, his first floating island built in 1998, was destroyed by Hurricane Juan. The widespread use of floating cities as a solution to rising sea levels seems unlikely, there certainly are other options that are effective and nothing short of extreme in their own way. In the Netherlands, where most of the country is below sea level, they have a long history of dealing with flooding and land loss. According to a paper compiled by the Calvin College Engineering Department, historic agricultural practices mixed with "sea level rise, tides, and storms, resulted in a country where one-third of the land lies below mean sea level and without dunes, dikes, and pumps, 65% would be under water at high tide." More than anything, it was the development of wind driven powered water pumps, later replaced by steam and diesel power, that allowed them to drain unwanted water towards expressly built drainage canals which allowed them to reclaim land that had been lost under the sea. Today these windmills are part of the imagery we see when we think of the Netherlands, and without them there might not be too much else. Dr. Clague warns that more than being unfeasible, developing floating island cities distracts us from looking at the factors that have lead us down this path in the first place; "I'm not closed off to wild ideas, but I think that's too wild. It creates a tangential conversation that does not address the problems we are facing on this planet, and it will require so many resources it might actually have a negative effect on our planet." At the same time however, he reminds us not to completely discount the possibility, saying "I'm 71 years old and I could not have imagined the world we live in now when I was a child, so I am not willing to be completely dismissive."